This morning I took the dogs to Kelley Point Park despite the wind and light rain. It wasn't too bad really- the weather usually keeps a lot of people (and their dumb off-leash dogs) at home and there were plenty of birds around. Little guys but so loud... My favorite birds of the day were two Pileated Woodpeckers- both a female working on a nice hole and a male flying from tree to tree calling. As for the juicer- it's been awesome! So far I have tried carrot/orange, carrot/beet/celery/lemon/ginger, carrot/orange/beet/ginger (in the photo below), and just now: orange/mango/carrot/ginger (a lovely shade of day-glo toxic waste orange). The next time I go to the store I will get some greens too. Juice=rad. One last thing! I just watched this preview of a movie debuting at SXSW this year on Stuart Immonen's blog, sitta canadensis. Looks awesome. The guy at 25 seconds thru 33 seconds is me, I swear. Nice shots! It's hard to get a good one of the Creepers what with their preference for hanging out and creeping in the shade (like all good shady creepy characters). Those Pileateds are a little more conspicuous. Is the juice at the end what you get if you mix a Pileated, a Creeper, and a Robin together? Now that looks like a fine film.....better than The Big Year, for sure. Jen - great blog you have here. 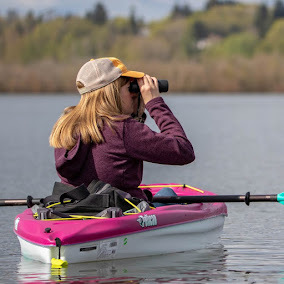 I'm a new birder in portland myself and I really admire the pictures on your blog. Do you mind my asking what lens and camera you are using? I have a 300mm zoom on my canon t3i and am always feeling like I can't get even near close enough. Also - I love the idea of your motorless list - I think I'll start one of those myself. Hey Chris, thanks for the kind words! I use a T1i with a 300mm lens myself, though only for the last two weeks. Before that I just had a 250mm. Motorless lists are great- mine definitely inspires me to ride my bike more. Have fun! Oops - looks like that I accidentally replied to a comment. Thought I was posting a new one. I hear ya! I grew up forty minutes north of NYC. I know there's plenty of nature there, but I agree- WAY too many people! I love Pileateds...I dont get to see them nearly often enough. Sweet creep shots. That movie looks great....FOR DWEEBS. Yes I would watch it. Great birds, Jen! I love the Brown Creeper and the Pileated. The juice sounds great, have you tried strawberries and bananas? Using expletives is one of the best parts of birding! Nothing quite like swearing out loud to yourself...I happen to do it frequently. Nice creepers and PIWO's - those guys can be so tricky to get good shots of!